Arthur Douglas Kemp Jones was born in 1893 Merthyr Tydfil, South Wales, the third son of Professor of Music and Bandmaster of the West Somerset Imperial Yeomanry, Frederick David Jones (b1861) and Bessie née Wilson (b1861). All nine of Frederick and Bessie's children were born in Merthyr Tydfil but between 1902 and 1911 the family moved to Yeovil. In the 1911 census they were listed living at 18 Brunswick Street and 18-year old Arthur was an apprentice in the printing works of the Western Gazette and spent over four years in the reading room. Arthur served with 'D' Company (Yeovil), West Somerset Yeomanry like his father and two brothers, and enlisted at Southampton on 22 August 1912, joining 59th Field Company, Royal Engineers. His Service Number was 23205. Arthur was sent to France on 18 August 1914. It is known that Arthur spent 2 years 3 months on active service with the Field Force - but where he served is unknown other than he served on the Western Front as part of 5th Division. He was seriously wounded during his service and on 19 October 1916, while chopping wood, an accidental puncture wound left him blind in his right eye. He was hospitalised and faced several operations without success. This eventually led to his honorable discharge from the army on 20 June 1917 and his death at his home at 18 Brunswick Street on 23 August 1917. He was aged 24 and was interred in Yeovil Cemetery. In its edition of 24 August 1917 the Western Gazette reported "The death occurred at his home in Brunswick Terrace, early yesterday morning, of Douglas Arthur, third son of Bandmaster Jones, of the W.S.I.Y., and of Mrs Jones. Deceased who was 24 years of age, had experienced two years and two month’s active service in France with the Royal Engineers, being discharged on June 20th, having completely lost the sight of his right eye, and otherwise seriously injured. He was formerly employed for about four and a half years in the reading room at the “Western Gazette” and joined the Regular Forces sometime before the outbreak of war, having previously served with the W.S.I.Y. (West Somerset Imperial Yeomanry). 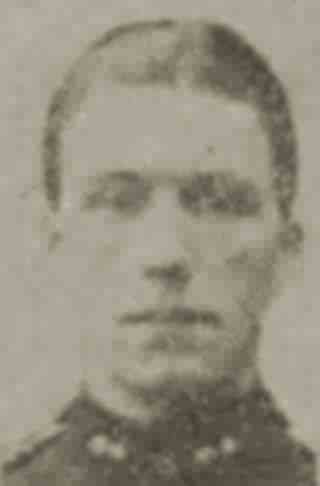 Deceased was also a chorister of the Holy Trinity Church and a prominent member of the Church Lads’ Brigade. He was very popular and highly respected in the town, and sincere sympathy is felt with his bereaved family. It is only about a year ago that Mr and Mrs Jones lost another son." In its edition of 31 August 1917 the Western Gazette reported "The funeral took place on Monday afternoon at the Cemetery of Mr Douglas Jones, whose death at his home at Brunswick Street, at the age of 24 years, was reported in last week’s issue. The late Mr Jones, who was formerly employed on the staff of the “Western Gazette,” joined the Army shortly before the outbreak of war, and served over two years active service in France, and had seen some severe fighting. He was discharged on June 20th, as the result of injuries. For the funeral the Yeovil Company of the 3rd Battalion, Somerset Volunteer Regiment furnished firing and bearer parties, the former according the usual honours to the remains of the deceased as they were brought from his home in Brunswick Street and placed in the hearse by the bearer party. Then the procession left for the cemetery in the following order:- At the head with arms reversed, the firing party, in charge of Company Sergeant Major Allbutt; the hearse and mourning coach containing Mr Trevor Jones, late W.S.Y., Lance Corporal Gilbert Jones, W.S.Y., Misses Amy, Flossie and Dilys Jones – brothers and sisters of the deceased; a large party of Volunteers; wounded soldiers from the Red Cross Hospital; the Men’s Voluntary Aid Detachment, under Section Leader J Goodchild; Quartermaster H Mott, V.A.D. ; and Captain and Adjutant Bell of the Volunteers, who was in command of the parade. The service was conducted by the Rev. GC Seymour, curate of the Parish Church. After a portion of the service had been said in the chapel, the Union Jack covered coffin was borne along paths lined by the troops to the grave, and after that they formed up near the grave, and in the presence of a large and sympathetic gathering, the committal prayers were said. At the close, the firing party fired the customary three volleys, and the “Last Post” was sounded by Private E Rattle of the Royal Berks, an old school chum of the deceased soldier. Bandmaster FD Jones, the bereaved father, was unable to be present owing to having been recalled from his leave before the funeral. There were several handsome floral tributes." Arthur Jones was interred in Yeovil Cemetery and his name is inscribed on the Yeovil War Memorial in the Borough. 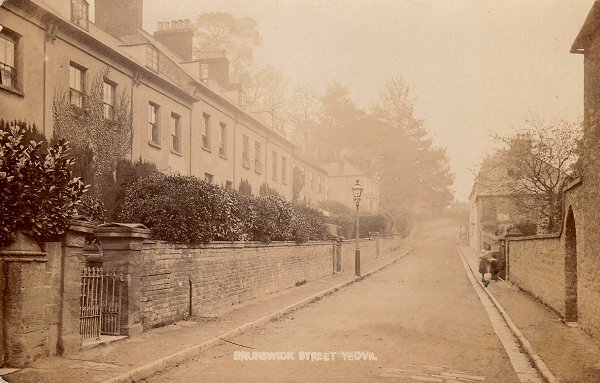 A postcard dated 1906 looking along Brunswick Street. The Jones family lived in one of the houses at left. Bandmaster Frederick Jones, West Somerset Yeomanry, of Brunswick Street, at left with his three serving sons; left to right Trooper Trevor Jones, West Somerset Yeomanry, Sapper Douglas Jones, Royal Engineers and Trooper Gilbert Jones, West Somerset Yeomanry. © © 2014 - 2019 Bob Osborn. All rights reserved.